Here's a quasi-port of the MP3 utility from "Eppla Xos". It includes three modes; a shade mode, a standard mode and a standard/equalizer mode. Comments and suggestions welcome. Enjoy. 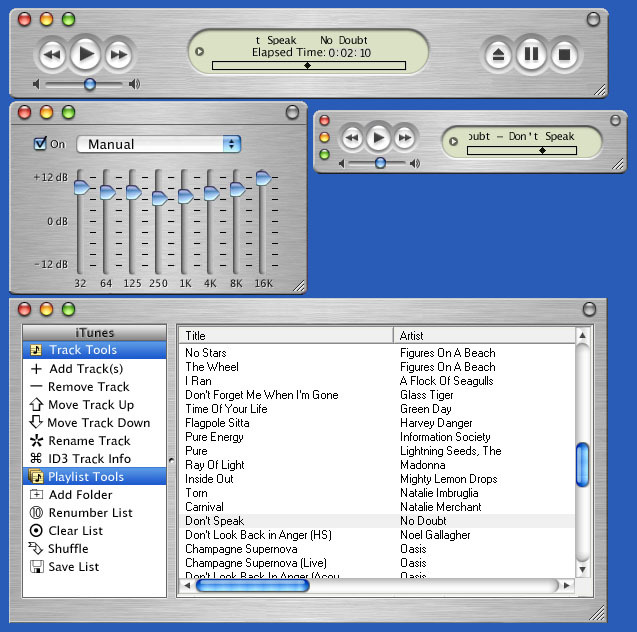 Updated 2/19/02: Some small bug fixes and some asthetic changes to better mimic Apple iTunes. Thanks to Aquafoft.org's Disciple and GameboyzGB for all the help. Beautiful skin, too bad it isn't original. I like those playlist icons. It's a great port. I love the style of the Mac. 2.06 not work playlist skin.